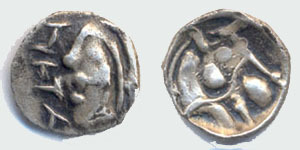 Imitation of Seleukid king Antiochos, 2nd – 1st centuries B.C. 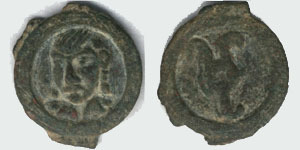 Obverse: Head of ruler right. Reverse: Forepart of horse right. 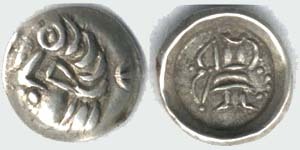 Sometimes mintmark in field. ( # 19 E.Zeimal’, Ancient coins …, pl. 9. #04 ). Аверс: Голова правителя влево. Перед ней согдийская легенда. Реверс: Изображение протомы лошади вправо. 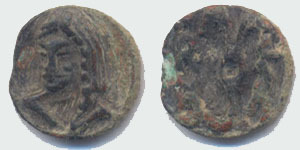 Imitation of Seleukid king Antiochos, 2nd – 4th centuries A.D.
Obverse: Остатки изображения головы правителя. Reverse: Forepart of horse right. В дальнейшем монеты этого типа уменьшались в размере, и в весе, и на последних этапах выпуска, стали изготавливаться из медного сплава. 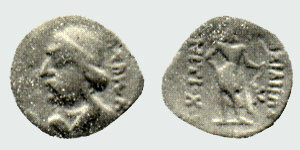 Unknown ruler, 1st - 2nd centuries A.D.
Obverse: Head of ruler left, distorted Greek legend behind. Reverse: Archer right. Distorted Greek legend on both sides. ( # 19 E.Zeimal’, Ancient coins …, pl. 31. #02 ). 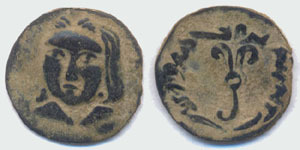 Unknown ruler, 2nd –3rd centuries A.D.
Obverse: Head of bearded ruler left. Sogdian legend above. Reverse: Archer in the center right, all in dotted border. ( # 19 E.Zeimal’, Ancient coins …, pl. 31. #08 ). 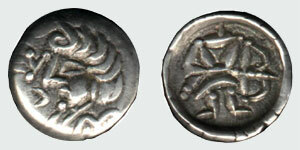 Unknown ruler, 4th-5th centuries A.D.
Obverse: Stylized head of ruler left. Sogdian legend near his face. ( # 19 E.Zeimal’, Ancient coins …, pl. 32, #53 ). Аверс: В центре монеты согдийская легенда. Реверс: Стилизованное изображение лучника вправо. Unepigraphic. Unknown ruler, 5th-6th centuries A.D. Obv. : Head of ruler (or queen) three quarter left. In the ears large earrings. 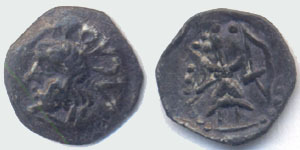 (#41 O.Smirnova, Catalog of Sogdian coins..., #1). Unknown ruler, 6th century A.D. Obv. : Head of queen (or deity) three quarter left. Rev. : Tamgha in the center, Sogdian legend on both sides. 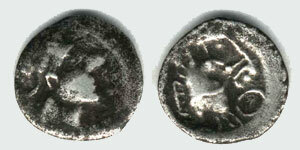 (#41 O.Smirnova, Catalog of Sogdian coins..., #26). Obv. : Head of ruler (or queen). 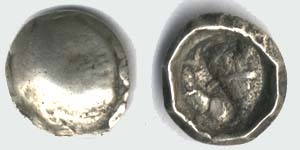 (#41 O.Smirnova, Catalog of Sogdian coins..., #33).